Some days are diamonds, some days are stones, so the John Denver song goes. There's another fable called Acres of Diamonds that suggests that we can spend so much time seeking wealth here, there and everywhere, that we neglect to notice the wealth (acres of diamonds) in our own back yard. If you've never read that one, Google and read...it's well worthwhile. So this week, I've had a couple of days that were diamond-ish, and quite a few more that were just ugly stones. I could have stopped in my tracks and wept copiously once or twice. I could have. But I didn't. I could have done what I did when I was younger, or what many of my friends do, when they have a day that's more of a stone (or even bigger...a boulder! ), than a diamond, and retreated for some 'retail therapy'. But I didn't. Instead, I came home, and looked for the Acres of Diamonds in my own backyard. It's a skill I've cultivated over many years, and it's not always easy. But inevitably I find that whilst I can't fashion a Diamond Day from an unyielding 24 hour boulder, I can sure as heck polish that boulder and make it shine a little. First stop for shining boulders around here, is not the workshop, or the cleaning nook. It's the kitchen, or more importantly the bookshelf in my kitchen. My library of cookbooks is extensive. I have some inherited from my Grandmother, some from Mum, others gifted, many gathered over a lifetime of loving my kitchen as a retreat from the world. This one is a book devoted to the Rose, which if you follow my blog, you'll know I love. It has hints and tips for growing roses, and many lovely project ideas for using them. Just looking at this pretty afternoon tea cheered me immensely. I imagined a day in the not too distant future when life is not so chaotic, when I will host a tea just like this one. It's almost Mary Poppins-ish, isn't it? ...sipping Rose Petal infused tea while the Rainbow Lorikeets squawk and chatter above us. Whilst I contented myself with visualising my pretty tea, this recipe for Rose Jelly called to me, but lacking as yet, any blooming roses, I filed that away for later. Still...what a divine thing this is. I made some several years ago, and a prettier shade of pink you cannot imagine! And eating it on a warm scone is like inhaling love and savouring it upon your tastebuds like a long kiss. So no rose petals, but knowing I had frozen mixed berries, I chose to make do, look for the acres of diamonds in my own back yard, and make a berry jam, which quickly filled my home with the tempting scent of simmering fruit. How can that not make you smile? Fruity and heady, and not nearly as delicate as simmering rose petals, but somehow more earthy and satisfying for that anyway. A gem nonetheless. I recalled too, that my Nanna used to do something with cream to make it uber thick and lush. Alas, leafing through her cookbooks yielded nothing, but I knew someone in Blogland had to know what this process that yielded thick yellow cream was, and even more importantly, how to replicate it. Those of you who live in the UK or have visited there would know what Clotted Cream is. That's how I eventually found something that sounded like what Nanna used to make. Certainly I remember her baking cream in large shallow tins to make this delicacy. Some research yielded this blog entry over at The Cupcake Project. On reading Stefs instructions, and the many comments following, I decided I'd try the slow cooker method to make my clotted cream. Basically you heat the liquid (milk or cream) until a rich, fatty, buttery crown forms on the top. You allow it to cool, then skim this thick crown into a jar or container, and use the liquid left behind as you would normal cream in a sauce or in baking. Now my Nanna had milk from her own cows for this purpose. Grandpa would milk the cows in the wee small hours, and bring it in when the kitchen was still dark. He'd then leave the buckets of milk in the bottom of their tiny refrigerator to chill. Nanna would come along later to work her magic. Again, Stef's instructions and the comments following were a wonderful resource and I found that to create Clotted Cream, you need milk that has not been homogenised. That is, it's been pasteurised for food safety, but the milk and what we used to call 'the top cream' have not been blended for a uniform product. Where I live in Australia, I easily sourced a local product, that was labelled Non-Homogenised. Many of the smaller dairies produce it, and most supermarkets and health food stores stock it nowadays, so it's not that hard to find. I also bought Whipping Cream, which is different to Thickened Cream, and decided to try both the Non-Homogenised milk and the Whipping Cream separately to make my Clotted Cream. I tried the Whipping Cream first. This is a runny cream, maybe also called Pouring Cream where you live. It is not the commercially available Thickened Cream, nor is it Double Cream. It pours easily, and is slightly thicker than milk. Now I know you're dying to know what to do next, so here it is. So simple you won't believe it. I poured 1 litre of cream into my old Monier slow cooker (crockpot), turned it on Low, and left it there, undisturbed for 10 hours. ...and after ten hours it looked like this. Be aware though, that it was night time by the time I took this shot, so it perhaps wasn't quite THAT yellow. I show you this shot, so that you can get an idea of what the 'skin', which essentially is your 'clotted cream' looks like. Going by Stefs instructions, I then should have refrigerated my cream. Instead as the temperatures here are at about 7C (44F) overnight, and because I knew my Nanna never put the baking trays in her tiny fridge, I popped the slow cooker into a large Esky (the sort of insulated bin you take camping) along with several ice packs, to allow it to chill and settle overnight. Come the next morning, I skimmed my Clotted Cream (so called because it literally forms a 'clot' or 'skin' on the surface of your cooked cream), into a container, and was very proud to achieve something mighty close to what Nanna used to produce. It's thick beyond compare, lush, buttery, rich, and has an oddly pleasing flavour that is neither, cream nor butter, nor is it cream cheese or Greek yoghurt, but if you can imagine, something like 'toasted cream'. It's like the difference you see, between a fresh piece of bread and a piece of toast, or a piece of salmon sashimi and roasted salmon. Sort of cooked and nutty tasting and subtly different to just plain double thick cream, It's also utterly addictive, so Friends, do NOT make this a regular treat. You'll be the size of a house inside a year...lol! It's a once-in-a-while treat for sure! My one litre (1 1/10th pints) of Whipping/Pouring cream, yielded just over a cup of clotted cream and 250mls (1/2 a pint) of liquid residue (which is still quite 'creamy'), to be used in cooking sauce or in baking. Having slept overnight with a stone around my neck, I awakened to a new day. Having then enjoyed my lush morning tea, fashioned really from nothing at all bar memories of a loving Grandparent, I'm ready to say that today is more of a Diamond. Oh, and that Non-Homogenised milk? That's in the slow cooker now. I'll give you a comparison update over the weekend! Now remember that Five Star Frou-Frou is now a neverending linkup, with my favourite new links being featured each and every time I post. 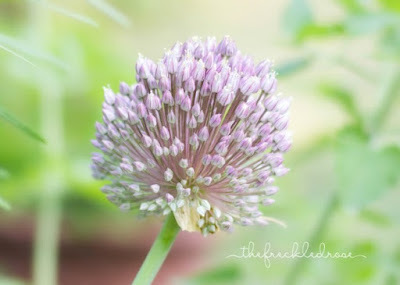 That honour today goes to Angie at The Freckled Rose, who shared a post on how to grow Elephant Garlic. The photographs accompanying this post are just gorgeous. Thanks Angie! Thank you so much for this post! This may sound strange, but I so wish I lived closer to you so I might visit and enjoy your Rose Tea Party. Well, even beyond that, just to sit and glean your knowledge and wisdom in homemaking. I'm so thankful I came across your blog a long time ago! I have had a huge boulder day this week myself. But everything works together for good and I'm trusting God to take care of all of us involved. He makes beauty from ashes and diamonds from dust. You are truly a diamond in this very wacky Internetland! I just traveled to DisneyWorld a few weeks ago. Mary Poppins is my favorite character. Love the picture of the tea! Blessings and diamonds be yours today! This is such a soothing post thank you. Well I just enjoying this post immensley, my dear! I bought some rose jelly and also lavender jelly from a nifty boutique at a tea house some years back and absolutely loved it. I haven't had it since but what a treat for the pallet! Yes, we don't have any true real clotted cream easily acquired around here in the mid States - I always order my England Devonshire Clotted Cream online. It is so good and so addicting and so so perfect on scones! I love you honored and remembered your grandmother when you successfully made her cooked clotted cream! Bravo and well done! And it seemed to perk you right out of the stone blues. Awesome. Good advice about polishing the boulder to make it shine and look a little more diamondish. When I was younger I used to do the retail therapy thing, but now-a-days it has the opposite effect and doesn't help at all. Love your lavender. Mine are just coming int flower. Enjoyed reading your post and the clotted cream sounds wonderful. I must try it. I love rose jelly and haven't made it in a few years, your post recipe looks so good. Mimi, I felt as though I stepped from the 'real' world into a far gentler one with this post. Thank you so much for writing it and for the lovely recipe/idea. I haven't enjoyed clotted cream for more than 35 years - since we honeymooned in England and I discovered it at the Lilliput Tea Shop in Bath. Strawberry flan and clotted cream if I remember correctly. It was delicious!! Keeping my eyes open for non-homogenized milk to try this out. Thank you for sharing and the memories! Brilliant! We love tea parties and scones here so I will give this a try. Looks delicious! Everyone needs a great recipe! I have my Nana's for clotted cream but I don't make it much anymore...not the easiest but the results are worth. it. Yours looks wonderful! Thanks so much for linking to Tuesday Cuppa Tea! This is the first time I've ever heard of the "Acres of Diamonds" fable. I'll have to look it up! I love clotted cream! Thanks for sharing the recipe. I have this teabook and love it. I have never made the Rose Jelly either but know some who have and violet jelly and pansy jelly. You clotted cream was quite the project too. You are to be congratulated! Lovely posting! That looks like a great recipe! Thank you for sharing at Home Sweet Home! Thank you Mimi. I've never tried clotted cream and always thought it would be incredibly hard to make, but now I'm intrigued and ready to give it a go. I think we have all had those days Mimi. Glad to see you found the diamonds in the rough! Very lovely read my friend! :) P.S. Your rose book sounds divine! Thank you Mimi for a lovely and precious post. I think I will have a go at the clotted cream and will find it easier with your recipe. Sharing is a lovely and sweet thing to do as so many enjoy the benefits they reap from you generous spirit for sharing. KerryAnne shares so many beautiful and lovely things to all of us out here in the land of the internet and that is why I love her website. It's a lovely place to come and relax for a while and see and learn. Thanks you and KerryAnne. God Bless you both.